Senior research director (DR0) at IRISA/INRIA in Rennes . Member of the PACAP team. Head of the former ALF (Amdahl’s Law is Forever) team (from 01/01/2009 to 30/06/2016) and CAPS (Compiler and Architecture for Embedded and Superscalar Processors) team (from 01/05/ 1994 to 31/12/2008) at IRISA/INRIA. Research on high performance computer architecture at IRISA/INRIA since 1983. October 2010, awarded an ERC Advanced grant, DAL, Defying Amdahl’s Law (kept me busy for five years (04-2011/03-2016)). K. Courtel (1991), N. Drach (1994), S. Hily (1997), D. Truong (co-advisor F. Bodin, 1998), E . Rohou (co-advisor F. Bodin, 1998), P. Michaud (1998), T. Lafage (2000), A. Fraboulet (2004), A. Darsch (2004),A. Djabelkhir (2005), E. Toullec(2005), O. Rochecouste (2005), C. Lauradoux (co-advisor N. Sendrier, 2007), T. Piquet ( 2008), J. Dusser ( 2010), J. Lai (2-2013), R. Vélàsquez (4-2013, co-advisor P. Michaud), B. Lesage (5-2013, co-advisor I. Puaut), N. Prémillieu (12-2013),B. Swamy (02-2015), S. Natarajan (06-2015), A. Perais (09-2015), A. Suresh (co-advisor E. Rohou,, 05-2016), S. Kalathingal (co-advisor S. Collange, 12-2016), A. Sridaran (12-2016), A. Mondelli (co-advisor P. Michaud, 09-2017). A. Seznec, J. Lenfant, “Interleaved Parallel Schemes”, IEEE Transactions on Parallel and Distributed Systems, Dec 1994. A. Seznec, J. Lenfant, “Odd memory systems: A new approach”, Journal of Parallel and Distributed Computing, May 1995. E. Rohou, F. Bodin, C. Eisenbeis, A. Seznec, “Handling Global Constraints in Compiler Strategy”, International Journal of Parallel Programming, august 2000. Olivier Rochecouste and Gilles Pokam and André Seznec,, A Case for a Complexity-Effective, Width-Partitioned Microarchitecture. ACM Transactions on Architecture and Code Optimisation (TACO), Volume 3 , Issue 3, September 2006. A. Seznec, “A Phase Change Memory as a Secure Main Memory”, IEEE Computer Architecture Letters, Feb 2010. H. Vandierendonck, A. Seznec, “Managing SMT Resource Usage through Speculative Instruction Window Weighting“, ACM Transactions on Architecture and Code Optimization , October 2011. N. Prémillieu, A. Seznec, “SYRANT: SYmmetric resource allocation on not-taken and taken path“, ACM Transactions on Architecture and Code Optimization , Jan 2012. N. Prémillieu, A. Seznec, “Efficient Out-of-Order Execution of Guarded ISAs“, ACM Transactions on Architecture and Code Optimization , Dec 2014. 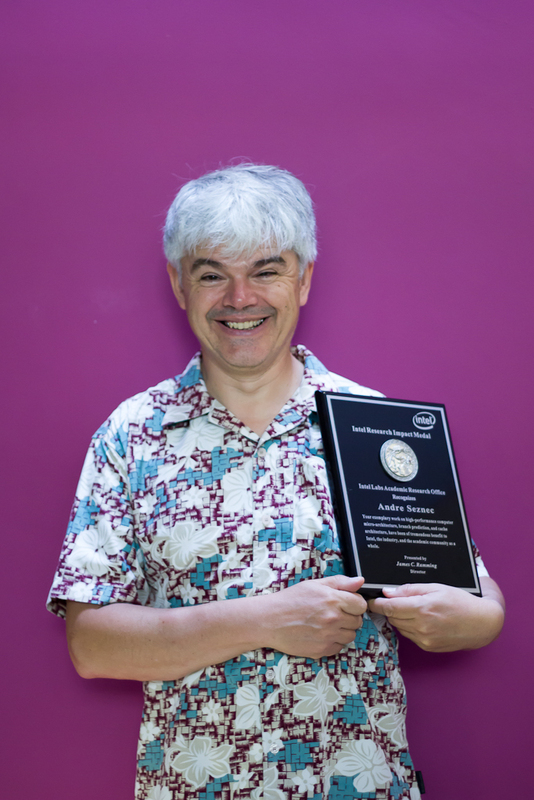 Pierre Michaud, Andrea Mondelli, André Seznec Revisiting Clustered Microarchitecture for Future Superscalar Cores: A Case for Wide Issue Clusters ACM Transactions on Architecture and Code Optimization (TACO) , ACM, 2015, 13 (3), pp.22. Arthur Perais, André Seznec EOLE: Toward a Practical Implementation of Value Prediction IEEE Micro, Institute of Electrical and Electronics Engineers, 2015, Micro’s Top Picks from the 2014 Computer Architecture Conferences, 35 (3), pp.114 – 124. <https://www.computer.org/web/computingnow/micro>. T. Lafage, A. Seznec, “Choosing Representative Slices of Program execution for Microarchitecture Simulations: A Preliminary Application to the Data Stream”, Workload Characterization of Emerging Applications, Kluwer Academic Publishers, also Workshop on Workload Characterization (WWC 2000), september 2000. A. Seznec, “Don’t use the page number, but a pointer to it”, Proceedings of the 23rd International Symposium on Computer Architecture (IEEE-ACM), Philadelphie, may 1996. A. Perais and A. Seznec. EOLE: Paving the Way for an Effective Implementation of Value Prediction. In Proc. of the 41th International Symposium on Computer Architecture (ISCA41), 2014. Slides, Fast Forward Slides. A. Seznec, “A new case for the TAGE branch predictor“, Proceedings of the 44th International Symposium on Microarchitecture (ACM-IEEE), Porto Allegre, Dec. 2011. André Seznec, Joshua San Miguel, Jorge Albericio, The Inner Most Loop Iteration counter: a new dimension in branch history , 48th International Symposium On Microarchitecture, Dec 2015, Honolulu, United States. A. Perais and A. Seznec. Practical Data Value Speculation for Future High-end Processors. In Proc. of the 20th International Symposium on High Performance Computer Architecture (HPCA20), 2014. Slides. A. Perais and A. Seznec. BeBoP: A Cost Effective Predictor Infrastructure for Superscalar Value Prediction. In Proc. of the 21th International Symposium on High Performance Computer Architecture (HPCA21), Feb. 2015. Arthur Perais, André Seznec Cost Effective Physical Register Sharing International Symposium on High Performance Computer Architecture, Mar 2016, Barcelona, Spain. P. Michaud, A. Seznec, S. Jourdan, “Exploring Instruction-Fetch Bandwidth requirement in Wide-Issue Superscalar Processors”, International Conference on Parallel Architectures and Compilation Techniques, Newport Beach, October 12-16, 1999. Thomas Piquet, Olivier Rochecouste and André Seznec, Exploiting Single-Usage for Effective Memory Management ACSAC, Seoul, August 2007. R. A. Velasquez, P. Michaud, and A. Seznec, ”BADCO : Behavioral Application-Dependent superscalar COre model”, Proceedings of the 12th International Conference on Embedded Computer Systems : Architectures, Modeling, and Simulation (SAMOS), 2012. Some workshops and newsletter papers. François Bodin, Zbigniew Chamski, Christine Eisenbeis, Sylvain Lelait, Erven Rohou, Antoine Sawaya, André Seznec, and Jian Wang. Towards a retargetable framework for software pipelining. In Proceedings of the 7th International Workshop on Compilers for Parallel Computers (CPC’98), pages 90-99, Linköping, Sweden, June 1998. F.Bodin, Z. Chamski, C. Eisenbeis, E. Rohou, A. Seznec GCDS: A Compiler Strategy for Trading Code Size Against Performance in Embedded Applications , 3rd Intl. Workshop on Code Generation for Embedded Processors, Witten – Germany, March 1998.